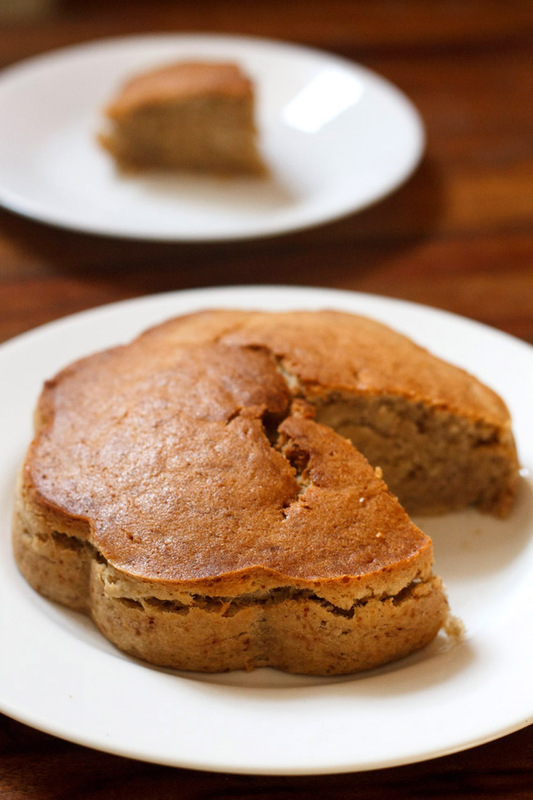 Eggless Banana Cake in Airfryer recipe with step by step instructions. 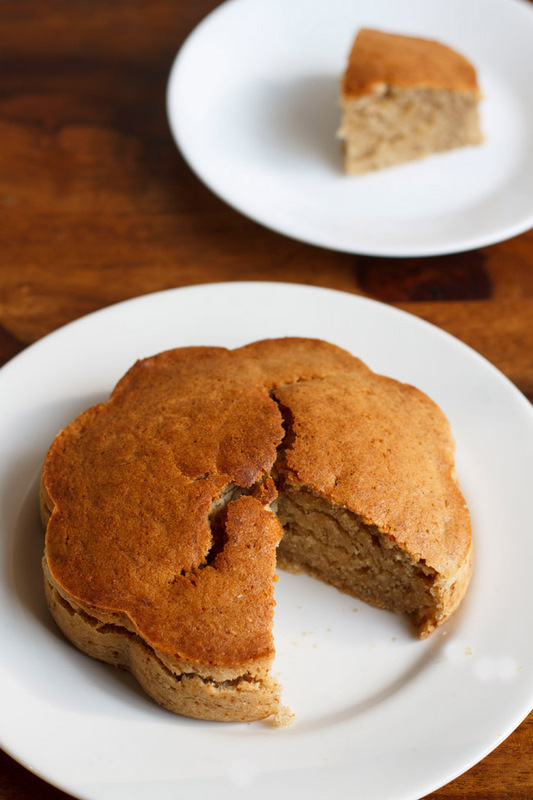 This is a delicious soft cake with two flavors one of coconut and other of bananas, once you take a bite you will get to taste the crusty exterior along the moistness of the cake. 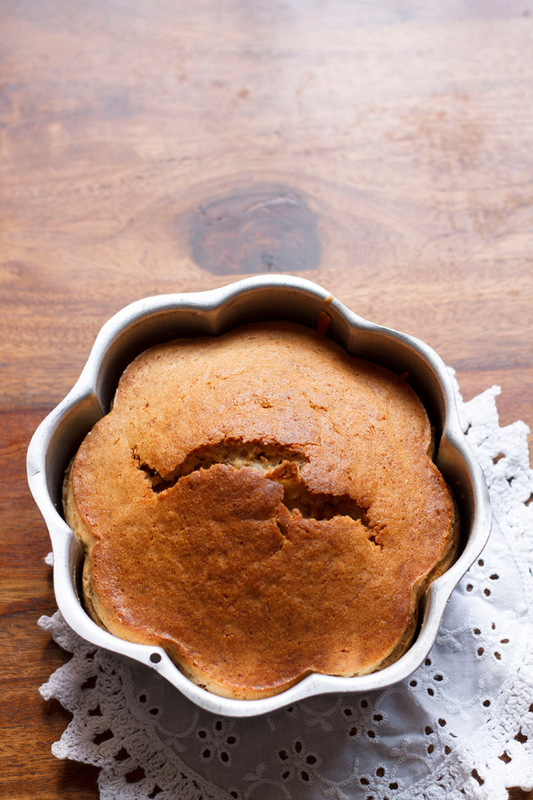 I am writing a post after a very long period and hence anxious to share this banana cake recipe with all my readers who have been missing my feeds and posts. I apologize had my own challenges so had to leave blogging for some time. 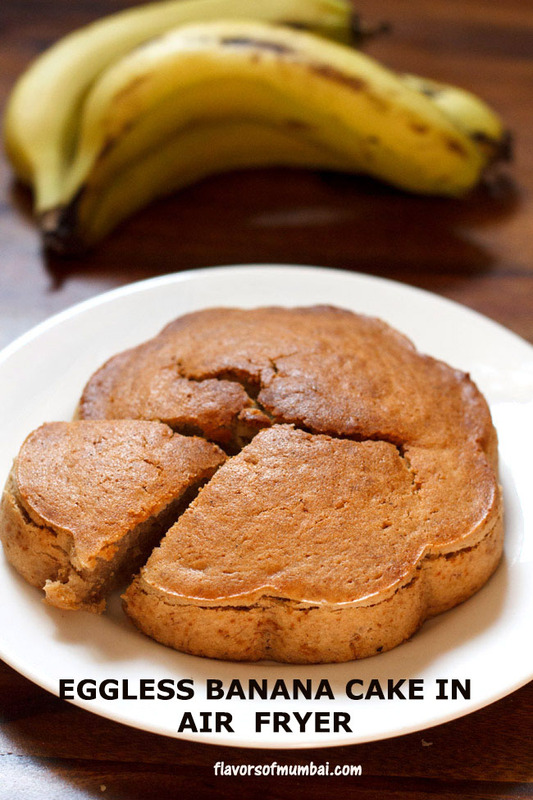 This eggless banana cakes obviously has no eggs also no butter used. Have used coconut milk and coconut oil so the cake gives a fantastic flavor of bananas with coconut. If you love bananas and coconut then this cake will be an enjoyable treat for you and your loved ones. 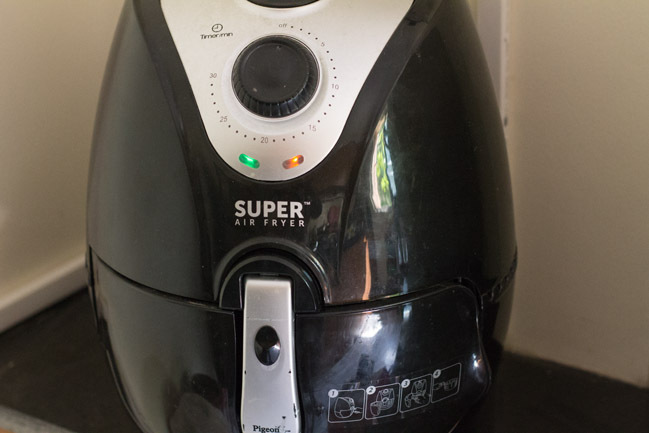 Airfryer is a new appliance and a great value addition to my kitchen. Thanks to my sister for gifting me with such a lovely and healthy option for cooking. For those who don’t know what is an Airfryer? Let me help you it is an appliance that cooks, bakes, fries by circulating hot air around the food using the convection mechanism. Best part of air fryer is it helps in consumption of less oil, takes shorter period of time to cook then oven also consumes less electricity and heat then oven. So all in all its a very good deal and value for money. You just have to take care of the baking temperature once you master that you will be a novice in baking cakes in the airfryer. I will be coming up soon with more airfryer recipes. 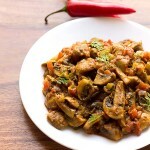 Would love my readers eating healthy and less oily food by sharing simple, healthy yet tasty recipes. I was amazed at the whole baking experience with this new electronic appliance. Have explained below the whole process so that you don’t have to worry about anything. 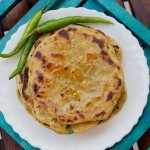 Alternatively you can bake them in the oven or otg. If you are fond of desserts then do try eggless mango muffins, eggless mawa cake, eggless fruit cake, eggless banana chocolate cake, eggless apple cake and eggless banana walnut cake. Moist, delicious and soft banana cake with no eggs, no butter and has a lovely coconut flavor. If you are planning to use an airfryer then check a cake pan or tin which goes inside or easily fits inside the air fryer tin. 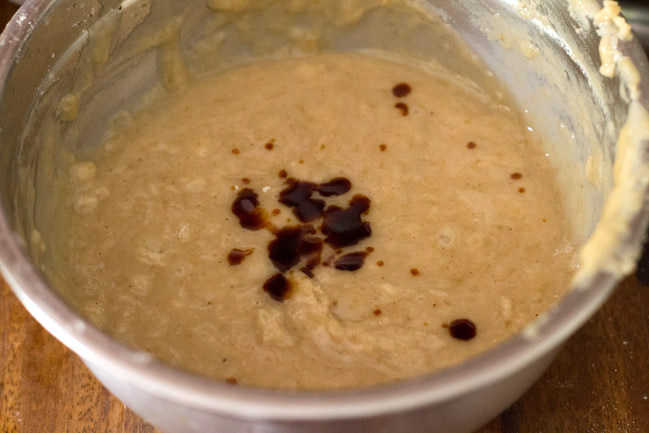 Just line with a parchment or baking paper, then pour the batter and bake. Alternatively you can bake in otg or oven. Grease your baking pan with butter, dust some flour and place aside.Sift 1 cup of flour, ¼ teaspoon baking soda, ½ teaspoon baking powder, pinch of salt, 1 tablespoon corn flour, 1 teaspoon cinnamon powder. Place the dry ingredients aside. 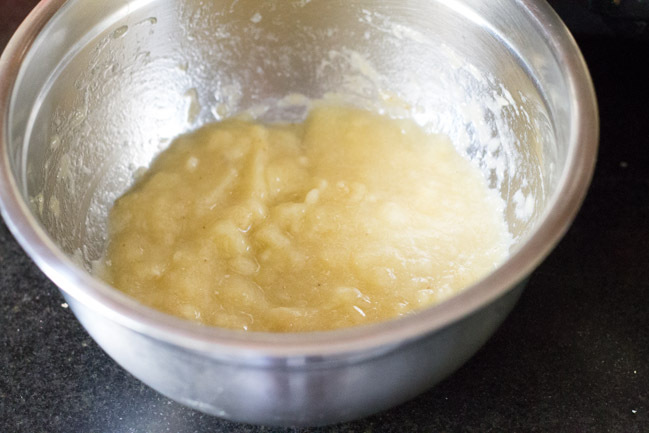 Just use ½ a cup of mashed bananas the rest you can eat or store in the freezer for future use. 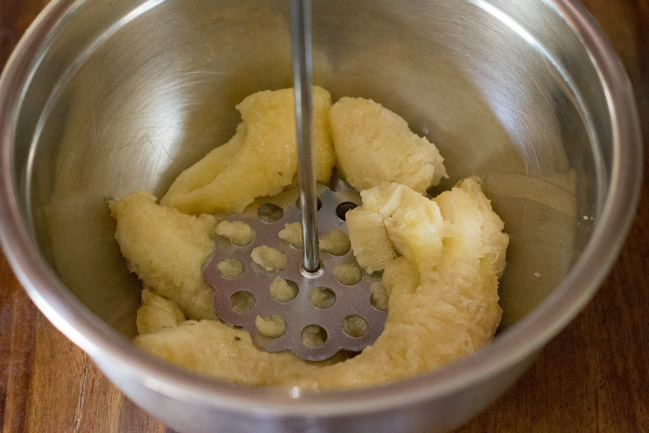 Ensure the bananas are mashed and they look smooth and do not have any lumps. 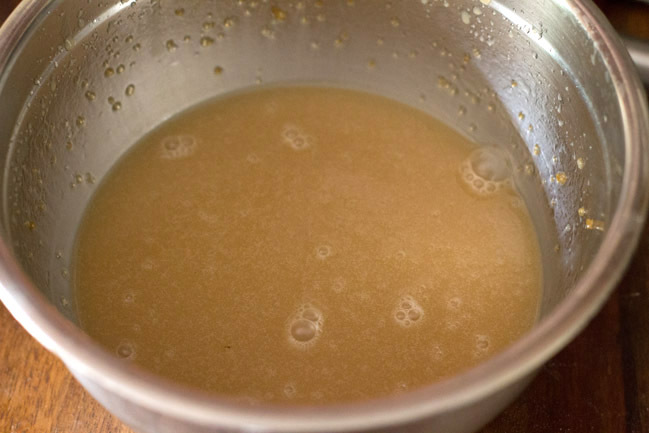 Take ½ cup sugar in a mixing vessel, I have used demerara brown sugar but you can use granulated sugar instead. 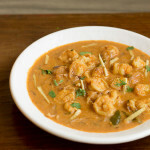 Pour in ½ cup of coconut milk. Also add ½ cup of coconut oil. I have used organic coconut oil for this cake recipe. 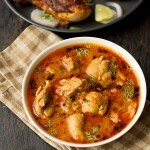 Alternatively you can use ½ a cup of butter at room temperature or use any vegetable oil like olive oil. Using a hand blender just blend until the sugar dissolves and the mixture looks smooth. 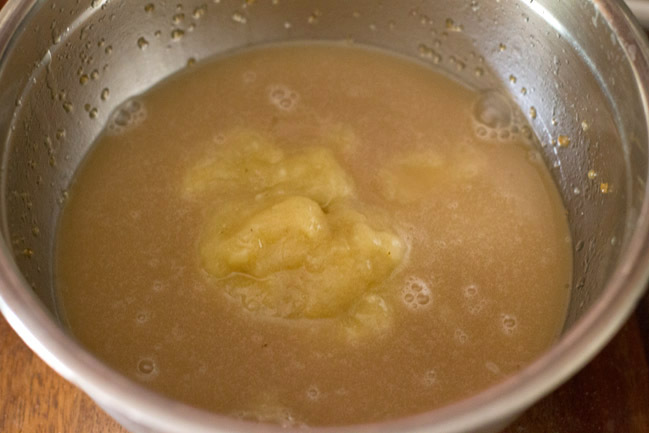 Add ½ a cup of mashed bananas and blend again till smooth. Its time to add the dry sifted ingredients. 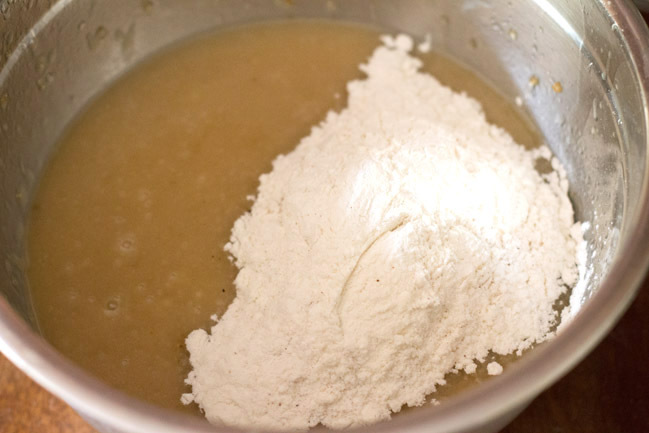 Add the sifted flour gradually into batches of three. Cut and fold the mixture with a wooden spatula. Don't over beat this mixture. Lastly add 1 teaspoon of vanilla essence, mix gently. Preheat the airfryer for 5 minutes at 200°C and if using oven then preheat for 10 minutes at 180°C. Pour the cake batter in the greased pan. Bake in the airfryer for 15 to 17 minutes at 160°C. Once your baking time is over. Don't open the airfryer allow the cake to sit for another 10 minutes in the airfryer. This is important as the cake will continue to bake in the hot temperature in the airfryer so don't tamper, be patient 🙂 After ten minutes remove gently and check with a skewer if its done or not. If not done keep for another 5 minutes at 160°C. If using oven then bake at 180°C for 35 to 40 minutes or till the cake is baked. Allow the cake to cool down, Slice the cake and refrigerate once it cools down. Should last in the fridge for 3-4 days. 1. 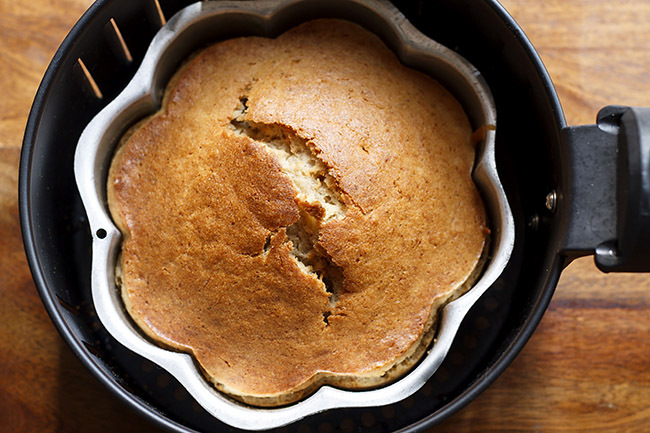 Don't forget to preheat your airfryer or oven while baking a cake. 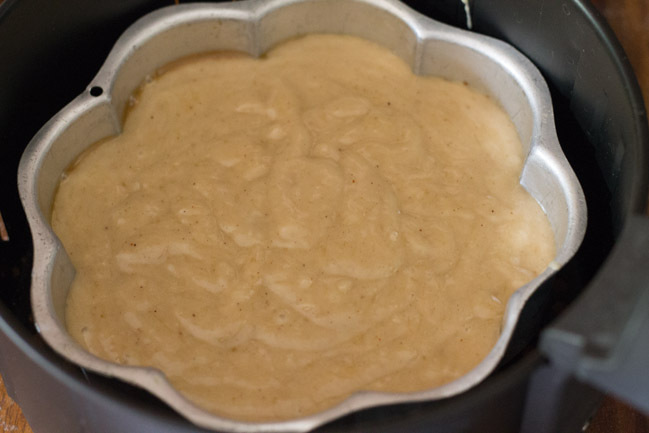 As once your cake batter is ready and if you wait for a long time then the cake may not rise evenly or bake properly. 2. Its important to use a good baking soda and powder, don't use them if its too old. Try using them on warm water if it bubbles then they are good to use. Always refrigerate them that increases their life shelf. 3. Know your appliances and you will understand how they function only if you bake or use them a little more. 4. If you fail its okay, just rise up muster some courage and start fresh again. Do this activity till you do not find success. 1. 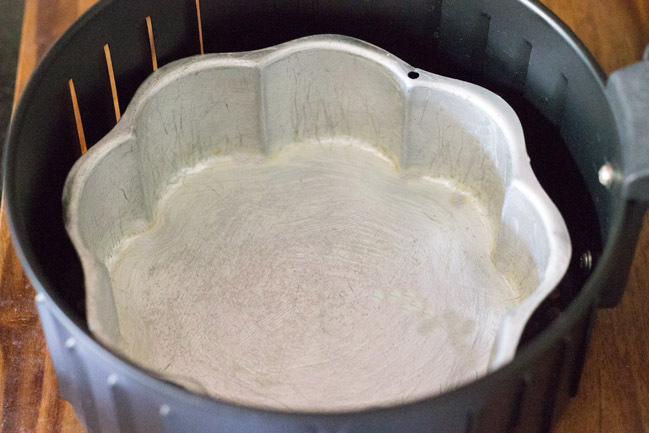 If you are planning to use an airfryer then check a cake pan or tin which goes inside or easily fits inside the air fryer tin. 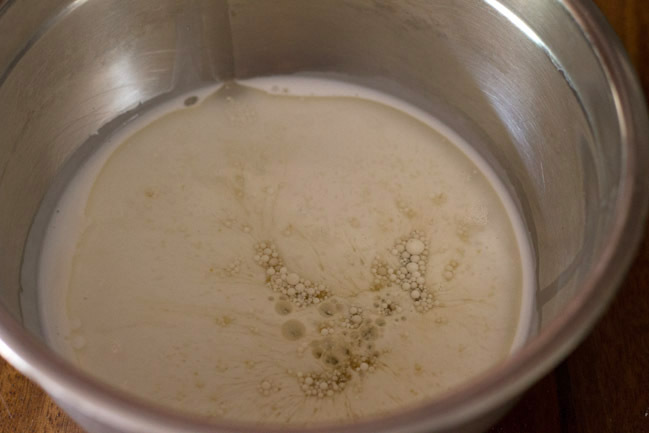 Just line the cake pan with a parchment or baking paper, then pour the batter and bake. But I prefer to use a baking tin to avoid any mess or spills later. Alternatively you can use the oven or otg for baking this cake. Grease your baking pan with butter, dust some flour and place aside. 2. Sift 1 cup of flour, 1/4 teaspoon baking soda, 1/2 teaspoon baking powder, pinch of salt, 1 tablespoon corn flour, 1 teaspoon cinnamon powder. Place the dry ingredients aside. 3. Take 1 long banana or you can use 2 medium sized bananas, peel and mash them with your finger or spoon. I have used a pav bhaji masher to make it more simpler. Alternatively you could use a hand mixie to blend the bananas. Just use 1/2 a cup of mashed bananas the rest you can eat or store in the freezer for future use. 4. 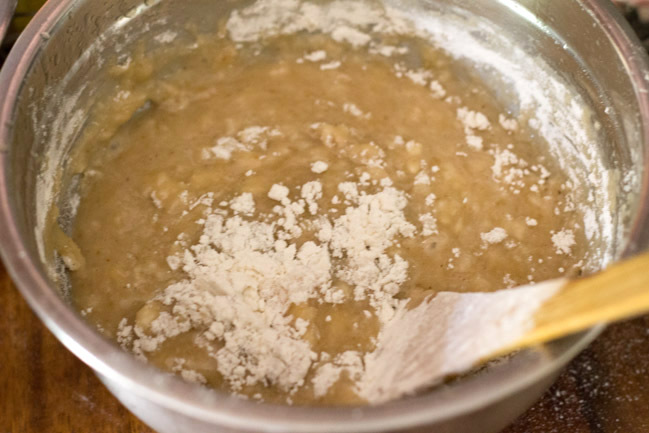 Ensure the bananas are mashed and they look smooth and do not have any lumps. 5. 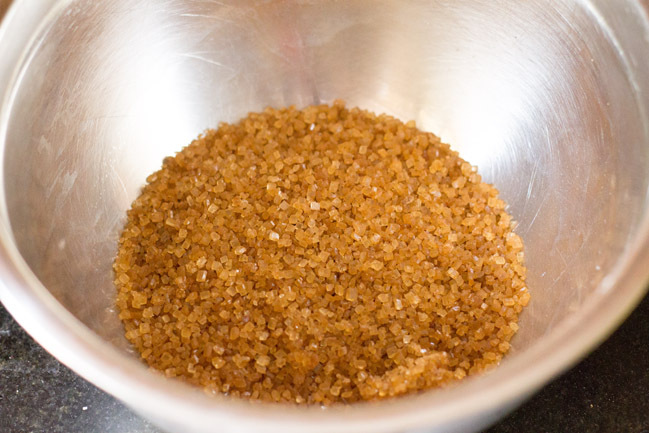 Take 1/2 cup sugar in a mixing vessel, I have used demerara brown sugar but you can use granulated sugar instead. 6. 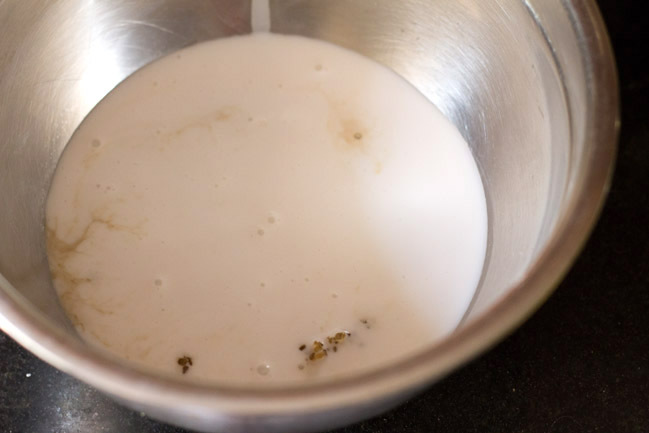 Pour in 1/2 cup of coconut milk. 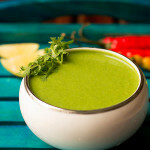 I have used Dabur coconut milk you can use of any good brand. 7. Also add 1/2 cup of coconut oil. I have used organic coconut oil for this cake recipe. Alternatively you can use 1/2 a cup of butter at room temperature or olive oil. 8. Using a hand blender just blend until the sugar dissolves and the mixture looks smooth. 9. Add 1/2 a cup of mashed bananas and blend again till smooth. 10. Its time to add the dry sifted ingredients. 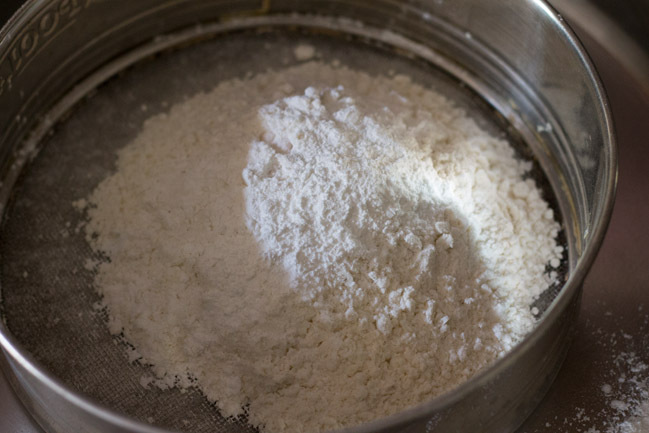 Add the sifted flour gradually into batches of three. Please don’t add all the flour at one time. 11. Cut and fold the mixture with a wooden spatula. Don’t over beat this mixture. 12. Lastly add 1 teaspoon of vanilla essence, mix gently. 13. Preheat the airfryer for 5 minutes at 200°C and if using oven then preheat for 10 minutes at 180°C. 14. Pour the cake batter in the greased pan. 15. Bake in the airfryer for 15 to 17 minutes at 160°C. a. Once your baking time is over. Don’t open the airfryer allow the cake to sit for another 10 minutes in the airfryer. This is important as the cake will continue to bake in the hot environment in the airfryer so don’t tamper, be patient 🙂 After ten minutes remove gently and check with a skewer if its done or not. If not done keep for another 5 minutes at 160°C. The best part is the cake automatically gets separated in the pan when baked in the air fryer. You can see in the pic below what I am saying. b. 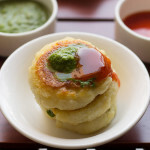 One more important thing to know is you need not modify any cake recipe whilst baking in the air fryer. Now it will sound more simpler and easier. You just need to understand the baking or heating mechanism, once you know how your appliance functions be it oven or air fryer things become simpler. If using oven then bake at 180°C for 35 to 40 minutes or till the cake is baked. Your house will be full of aroma coming from banana and coconut. 16. Allow the cake to cool down, I was impatient just waited for 5 minutes and inverted my cake, sliced and ate it. Although had to take pictures so just waited for ten minutes, clicked the pics and then popped the cake in my mouth, the fragrance was so tempting and so the taste. 17. Slice the cake and refrigerate once it cools down. Should last in the fridge for 3-4 days but the cake is so yummy don’t think you will have to wait that long.